The Holi festival, marked as one of the most colorful and joyful festivals in Hindu culture, is celebrated each year to bid farewell to the winter season and welcome spring. The festival is celebrated on the full moon day of the month of March – also known as the month of Phalgun in the Hindu culture. 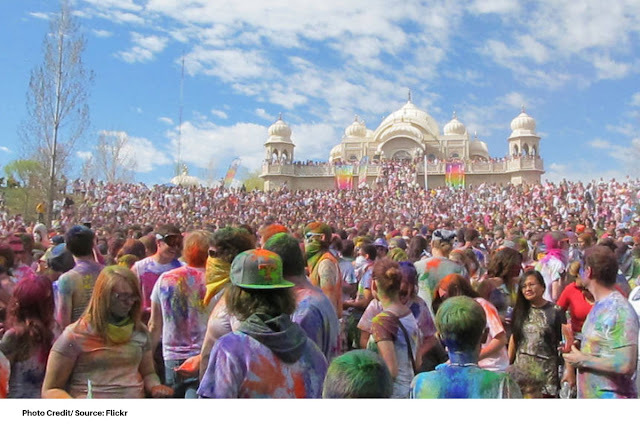 In Utah, the festival is held each year at the Sri Radha Krishna Temple located in Spanish Fork. In addition to the crazy fun that accompanies the event, this temple is also fully welcoming to all people, regardless of their religion. Visitors are invited to throw a handful of colorful chalk (symbolizing worries) to the wind as they enjoy the event. Here are some interesting facts you need to know about Utah’s famous Holi Festival of Colors. The festival gets its name from Holika, a demoness sister of an evil king named Hiranyakashyap in the Hindu mythology. The legendary tale goes on to reveal that the evil king tried to forbid his son, Prahlad from worshipping Lord Vishnu. Prahlad, however, did not part with his faith and continued worshiping Vishnu. In an attempt to get rid of his son, the villainous king ordered Holika (who was immune to fire) to enter the blazing fire with Prahlad in her lap. The story goes on that the evil-minded Holika was reduced to ashes, but Prahlad was saved because of his extreme devotion to Lord Vishnu. Since then, the Holi celebrations have prevailed to serve as a reminder that good triumphs over evil - which reflects the Hindu belief that faith and devotion lead to salvation, and can be attained by everyone who believes. 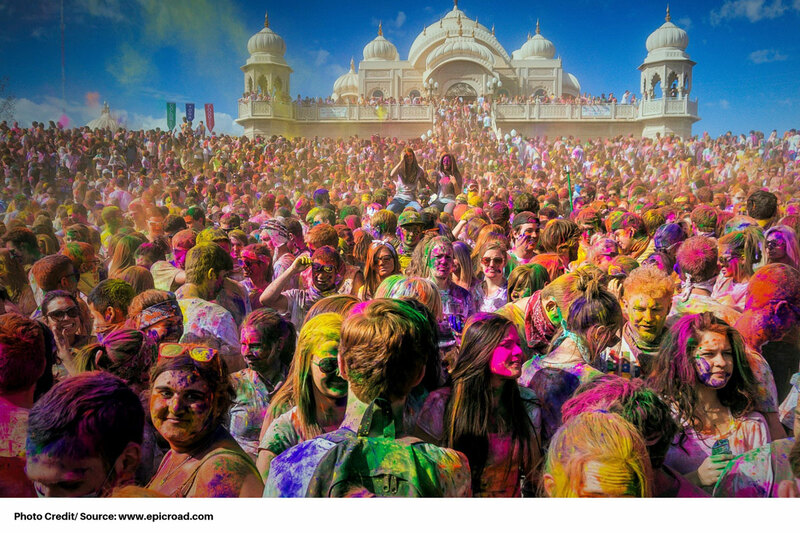 The colors used in the festival hold special significance. Red symbolizes love, fertility, and matrimony, blue represents Krishna, while green stands for fresh beginnings. 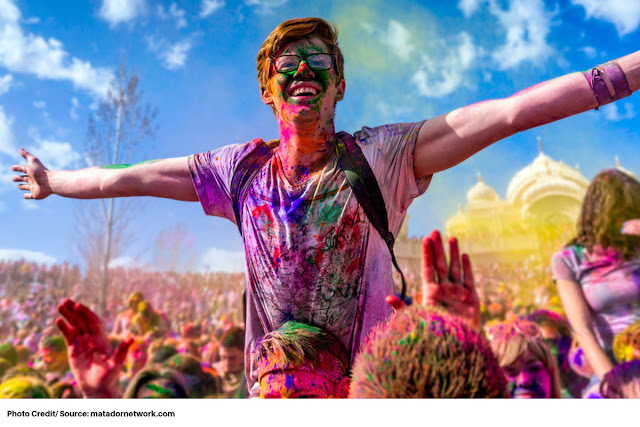 This year (2019), the Holi festival will be on the last weekend of the month - on 30th and 31st, consecutively. On Saturday the 30th, the event will be open from 10.00 a.m. to 5.00 p.m., and from 11.00 a.m. to 4.00 p.m. on Sunday the 31st. There’s an entrance fee of $5 per person. The entry fee for children below the age of 12 is absolutely free, so you can tag your little kid or sibling along, provided you keep a close watch on them. The temple provides the guests with ‘chalk’ which is actually colored corn-starch. The chalk should not stain your clothes (provided you don’t get wet), but I would still advise against wearing your best clothes. Five assorted vivid colors (green, pink yellow, violet, & orange) are available on the festival grounds at the cost of $3 per 100g bag. The colors provided are not only environmentally friendly, but also brightly colored, and beautifully scented. The nature of the colors means that they are also risk-free to people allergic to powders (apart from the small percentage allergic to corn). The color throws start from noon, following each hour afterward. Even as you get to enjoy yourselves, please refrain yourself from throwing colors directly into other’s people eyes or mouth. In addition to chalk throwing, there are numerous other fun activities which include dancing, yoga, the lighting of a bonfire, musical interludes, burning of an effigy in between the color throws, and much more. If you plan to indulge in the fun activities that are lined up this year, bracing yourself with some tips might just be what you need to get the most out of the event. Generally speaking, this event is more of a spiritual event than a religious one. The festival is meant to remove barriers and recognize all as part of one big spiritual family. This might explain why the event is becoming so popular, with the audience reportedly increasing each year. As these festivities draw locals across the entire state, the numbers can reach up to 40,000 or more in a single day. 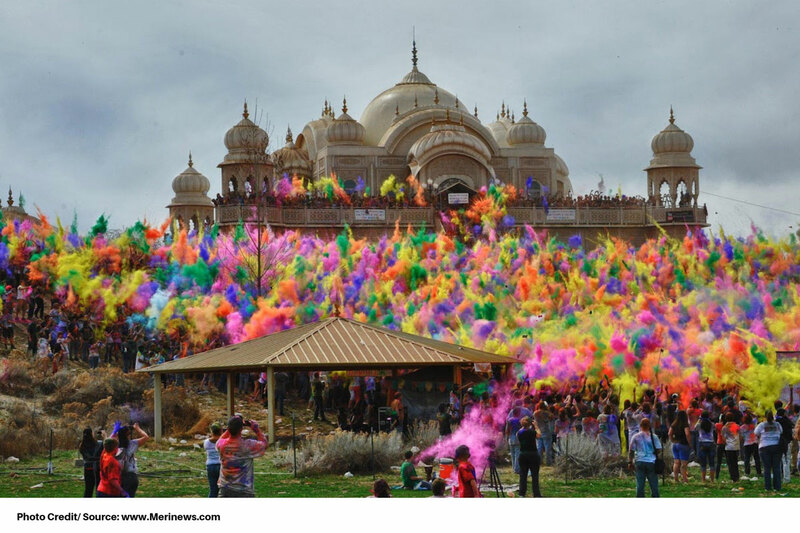 With the attention the Holi festivals in Utah have been receiving lately, we’ve also seen an increase in visitors flying from all over the world so as to be part of the event. Do not wear eye contacts to the color event. If it is protective gear you are seeking, there’re plenty of bandanas, sunglasses, and dust masks offered at a throwaway price on the grounds. The dry powder provided by the temple is stain free as long as it remains dry. Once in contact with water, the powder is highly likely to stain your clothes which is why you are advised against wearing your ‘best’ clothes. In short, bring along clothes that you are fine with being ruined. If you have breathing problems such as asthma or have corn allergies, it is advisable you refrain yourself from delving deep into the crowd since it is where color throwing starts. Under no circumstances should you let your little ones wander deep into crowds alone. Make sure that they are well covered in protective gear also. If possible, carry them on your shoulders while delving deep into the crowd. It may sound obvious, but make sure you refrain yourself from throwing colors at performers, musicians, passing cars, or the uniformed personnel as this could land you into unwanted trouble. It is no secret that excitement can sometimes get the better of us, and we might end doing some things that we regret later. To ensure a smooth experience for you and others, make sure you refrain yourself from these acts. Don’t bring outside colors as they will be confiscated on sight. The main reason why outside colors are not permitted is that they tend to threaten the existence of the festival altogether. Not all colors are friendly to the human skin, and the only way to guarantee that everyone stays safe is by sticking to the ones offered on the festival grounds. Drugs, alcohol, and smoking are not permitted on the festival grounds. Do not throw colors before the countdown ends, else, you will spoil the much-awaited fun. Last but not least, refrain from violent acts. This should be a fun moment for all since no one has lesser rights to be there.